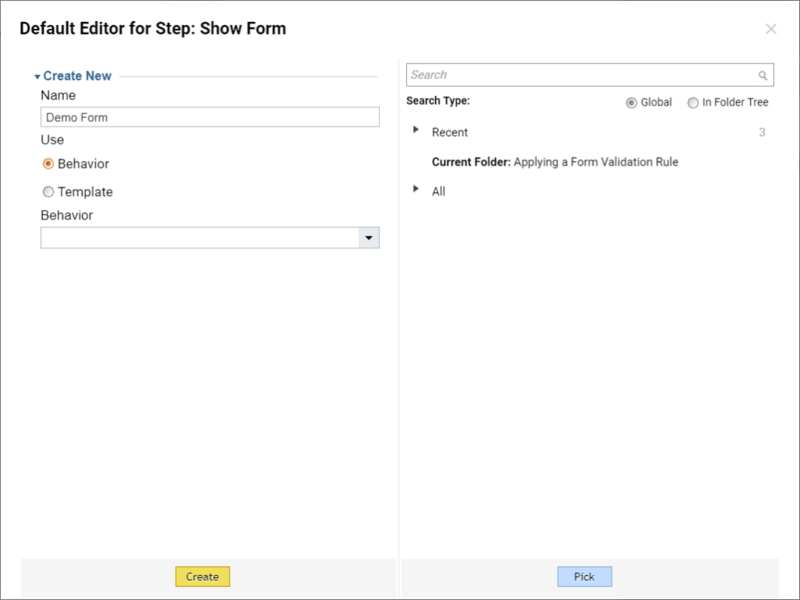 In the following tutorial we are going to demonstrate how to use the Rule that we have built in Creating a Form Validation Rule	tutorial on the Form . 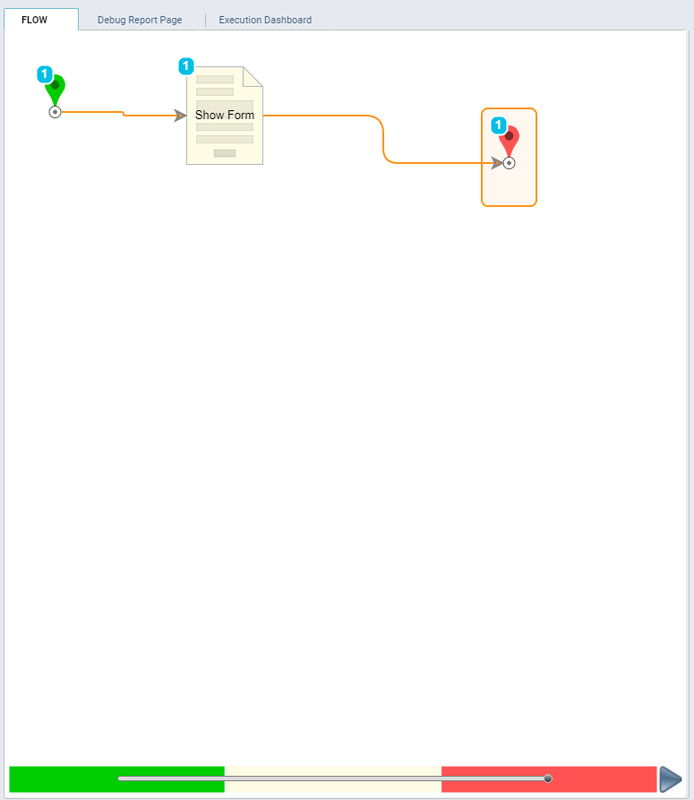 In the Designer Folder	we click Create Flow	on theFolder Actions Panel . 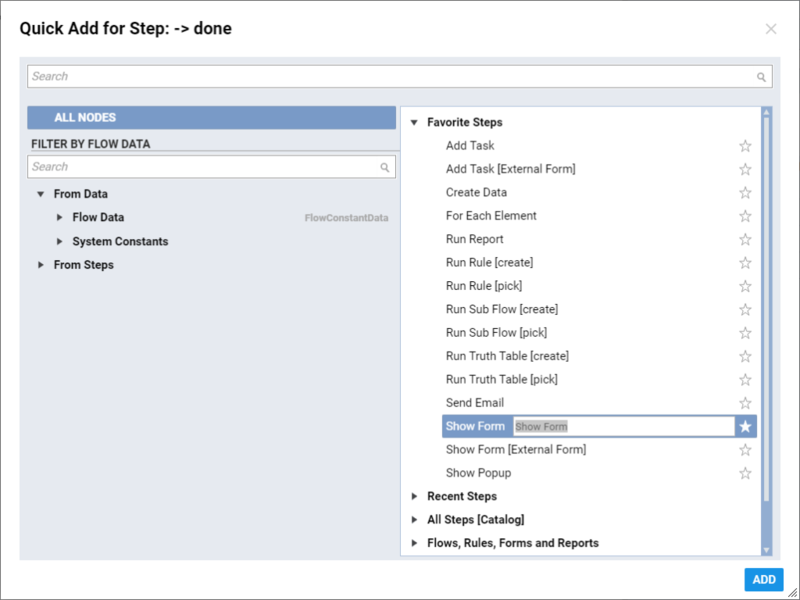 In the Flow Designer we add Show Form	from Favorite Steps	category. 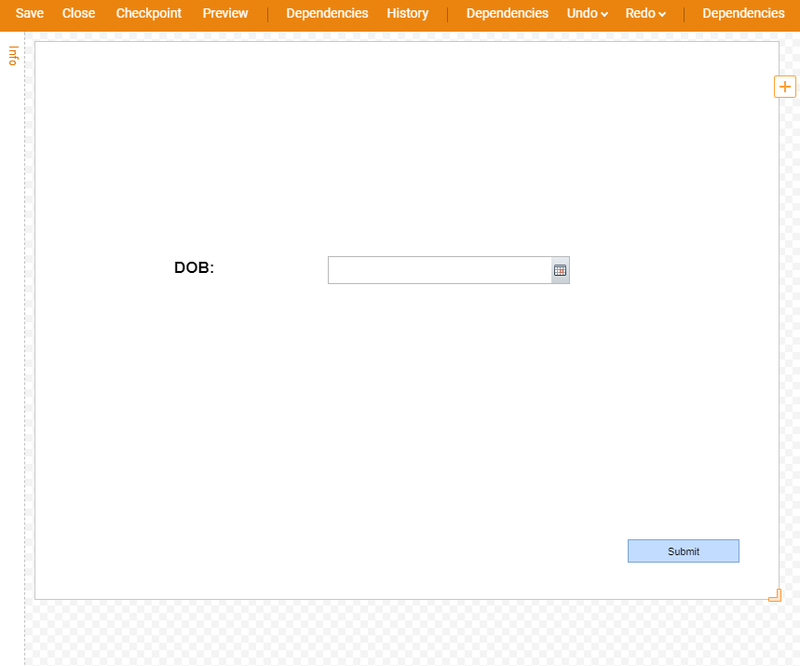 We Name	a Form and click Create	to proceed to the Form Designer . Our Form layout looks as following… We have a Date Time Picker	control for user to be able to pick date, a Label	, and a Button	control for user to be able to submit the Form . 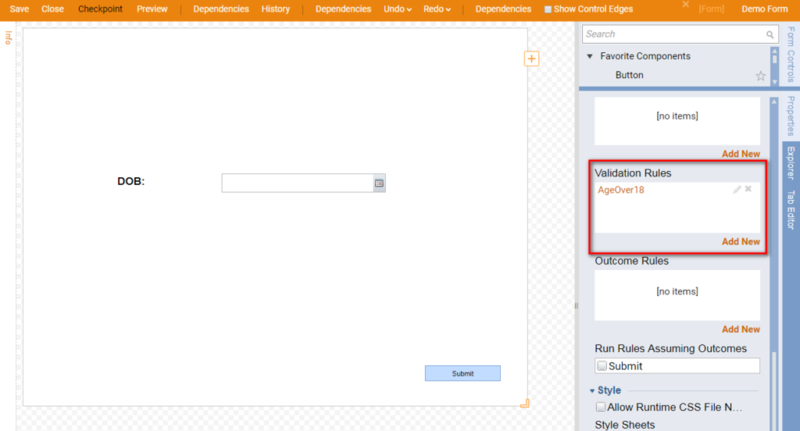 In the Form Properties	panel on the right we locate Validation Rules	category in Form Rules	section and click Add New . 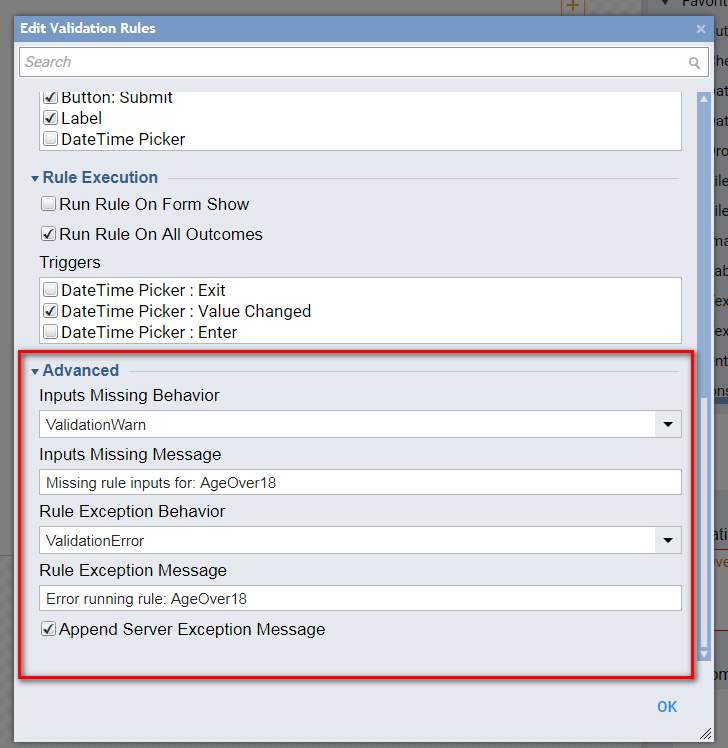 In the Add Validation Rules	dialog we locate Validation Setup	section, provide Name , keep Validation Source	– Rule , and click Pick	under Rule	options. 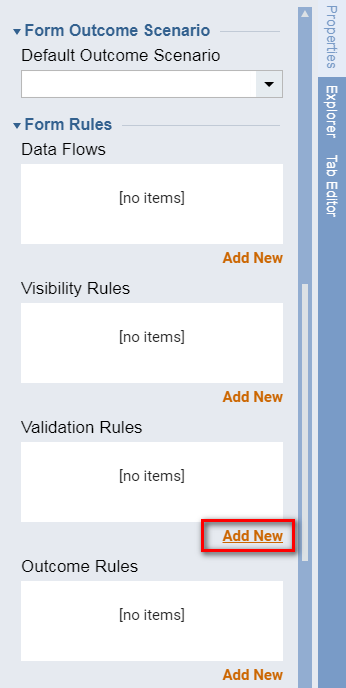 In the Entity Picker	window we search for our Rule	, select it and click PICK	. After we picked a Rule	we need to Update Rule Inputs	. DOB Rule	input shows up and we click an icon to edit it. 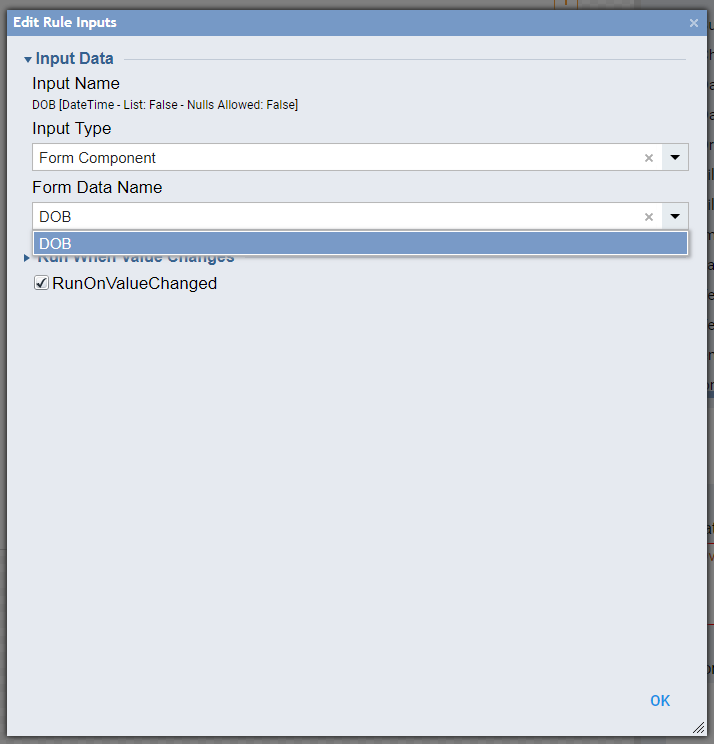 In the resulting Edit Rule Inputs	window we select Form Component	in the Input Type drop-down. 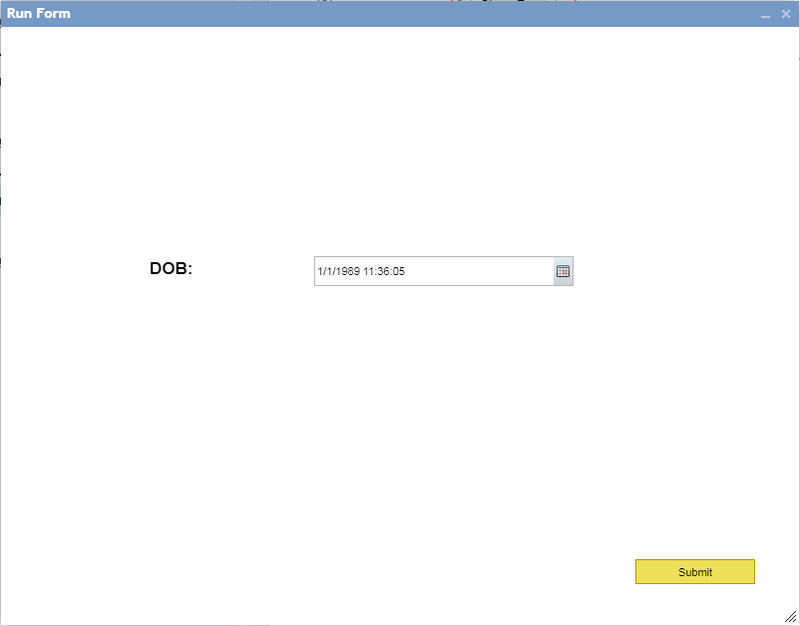 Then, we select our DOB data value in Form Data Name	drop-down. 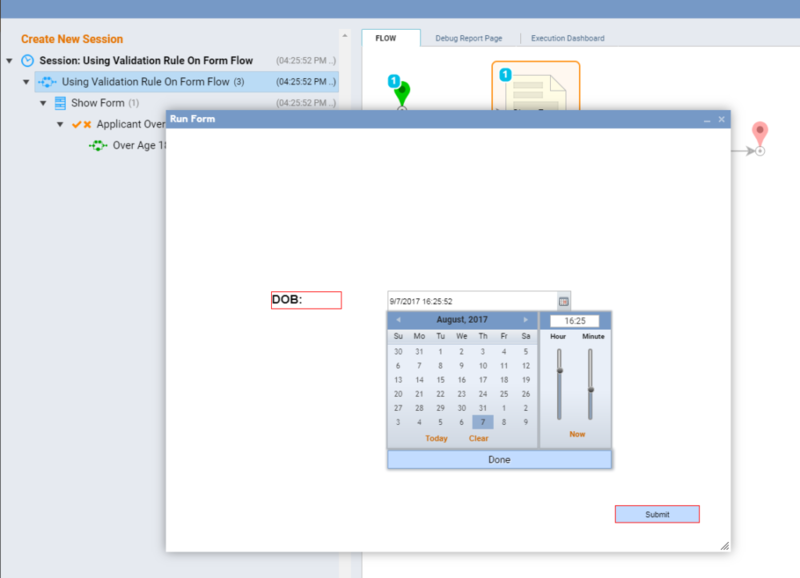 In this example we are going to run this Rule when DOB value is changed. When finished, click OK	to save and continue. Then, we edit Validation Break Text	. 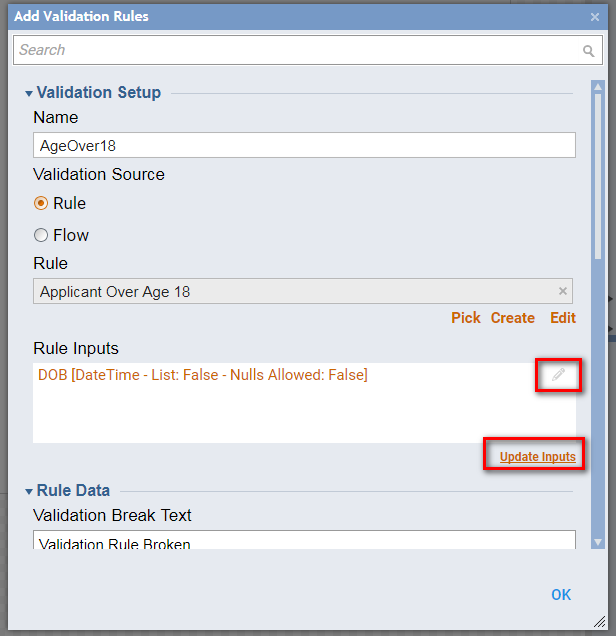 This message will show up on the Form if our Validation Rule	returns “False” . From the Break Level	drop-down we can select Fatal or Warning . Fatal level will not let the user to submit the Form . Warning level will only display the message. 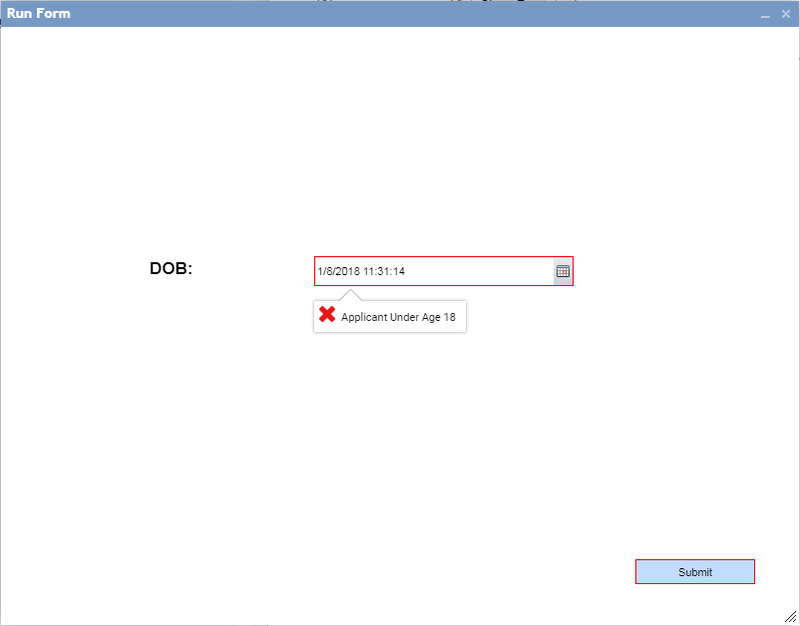 Next, we pick the controls to which we need to apply this Validation	to (in this example Button and Date Time Picker) . 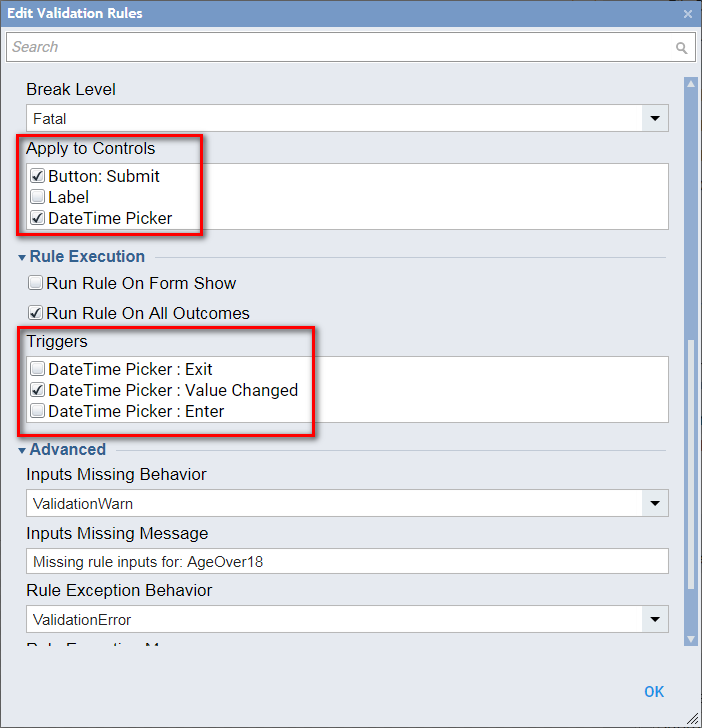 In the Rule Execution	settings we pick events that will Trigger	this Validation Rule	(in this example Date Time Picker : Value Changed). 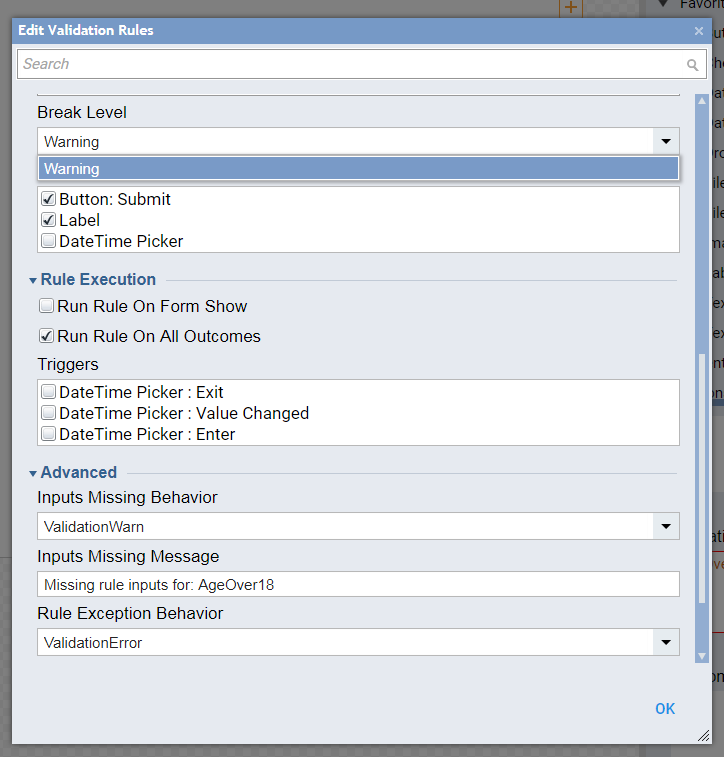 We keep Advanced	settings default and click Ok	to save Validation Rule	and continue. 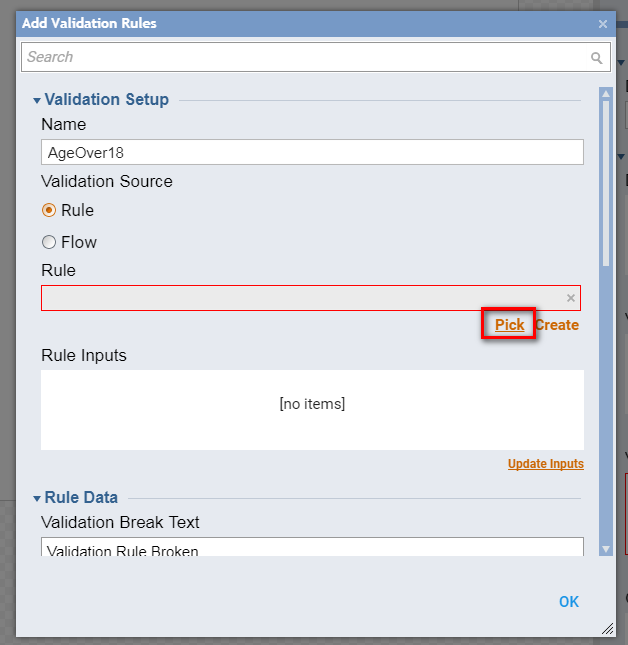 Validation Rule	is added. This completes our Form . We save the Form and close Form Designer. Back in the Flow Designer we connect the outcome from the Form to the End Step . This complete our Flow . 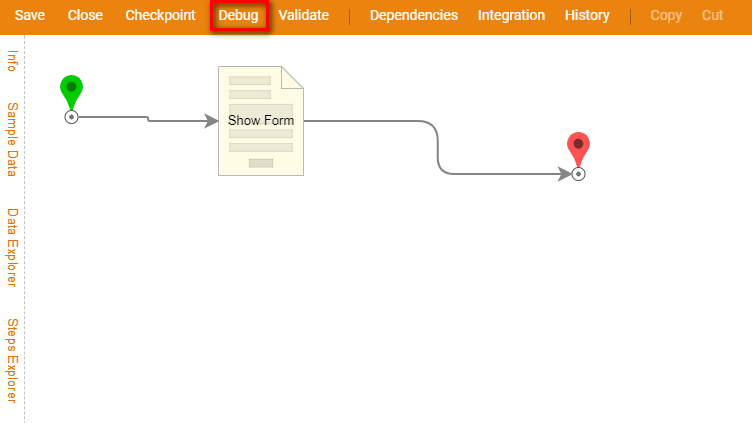 We click Debug Flow	on the top panel of the Flow Designer to test. The Form loads and we pick a date that less than 18 years in past. 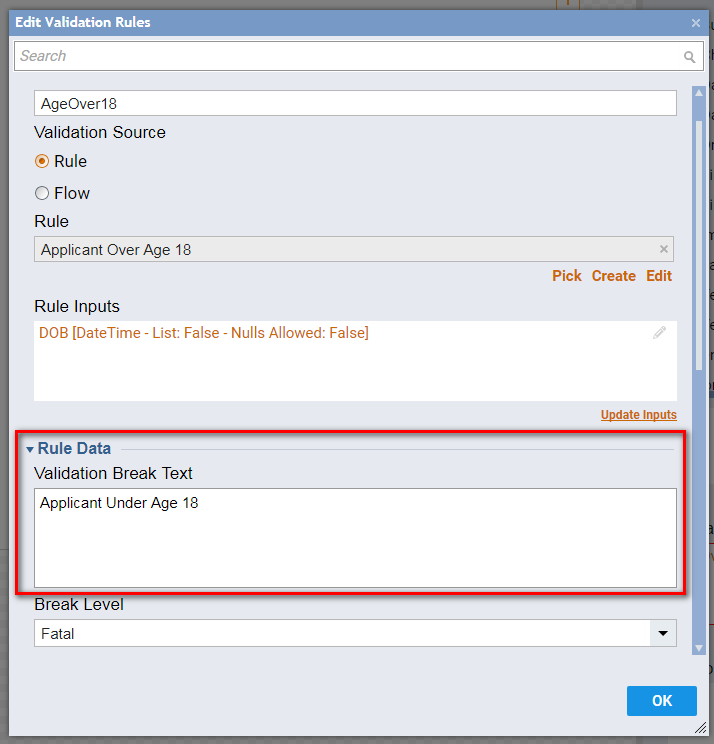 Validation Rule is triggered and returned “False”. Validation message shows up as designed. 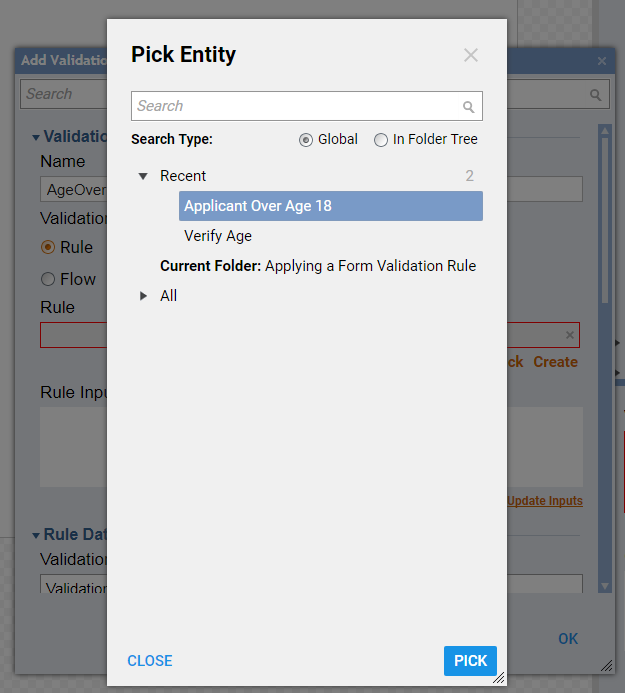 If we pick appropriate date, Validation Rule returns “True” and we are able to Submit	the Form .